BE SURE TO READ THE INTRODUCTION TO THIS SERIES FIRST. Jesus taught his disciples: “I have come that you may have life and have it abundantly.” (John 10:10) What can we learn from Jesus’ lifestyle that will allow us to experience an abundant life? Jesus often spent all night in meditation, communing with God. Meditating on a regular basis is an essential step in living a more abundant life. There are a variety of types of meditation. 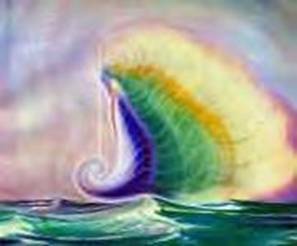 Those of you in healing touch, and similar modalities of meditative healing, are ministering to people while in attunement with Spirit. Some types of meditation strive to calm the mental, emotional, and physical bodies by chanting a mantra that clears the mind and promotes relaxation. Still others are focused on working for the planet in cooperation with our guides in spirit. The kind of meditation that sustained Jesus was one in which he attuned to our heavenly Father with the goal of being refueled, strengthened, and guided. The Psalmist refers to this type meditation: “I will lift up mine eyes to the mountain from whence comes my help. My help comes from the Lord, who made heaven and earth.” (Psalm 121:1-2) This form of meditation includes learning to view life through the eyes of God: by listening to our intuitive guidance, reading and meditating upon a sacred text or devotional, and journaling. Its focus is upon our own individual spiritual growth and communication with our indwelling God. It involves the integration of our meditative insights into our lifestyle. Jesus—speaking the words of “the Father”—taught his disciples, “I AM the bread of life. Whoever comes to me will never be hungry, and whoever believes in me will never be thirsty.” (John 6:35) Jesus set the example for us: meditate on a regular basis in order to eat the bread of our indwelling God. While in meditation, we are to find nourishment for ourselves—through the Father within. As a result of meditating and beholding life through the eyes of God, Jesus lived his earth plane life in harmony with all of creation. He spent long hours teaching the crowds that followed him wherever he went. When his disciples grew concerned that no one had eaten for days and many were far from home, Jesus felt no concern. He knew universal law: there is no lack. We live and move and have our being surrounded with an abundant supply of all we need. It is as we meditate and learn to view life through the eyes of God that we come to know this fact. Jesus often grew impatient with his disciples because they seemed never to comprehend. Jesus knew that a few fish and loaves of bread could be blessed and given out in unlimited abundance. It is only as we think in terms of not having enough that we experience lack. Heretofore, we have lived in a world that screamed, “You do have not enough.” Our economic system has been based on gross materialism. If we were not continually purchasing one product after another, we were informed the economy was headed toward a recession. We reacted just like the disciples: we began to worry, to save for a rainy day, and to hold back on our sharing with others. When the disciples suggested that Jesus send the people from the countryside into the villages, so they could purchase food, he answered them: “They need not go away; you give them something to eat.” His disciples answered much as we would—in terms of lack: “We have nothing here but five loaves and two fish.” Jesus responded: “Bring them here to me. Then he ordered the crowds to sit down on the grass. Taking the five loaves and the two fish, he looked up to heaven, and blessed and broke the loaves, and gave them to his disciples, and the disciples gave them to the crowds. And all ate and were filled; and they took up what was left over of the broken pieces, twelve baskets full. And those who ate were about five thousand men, besides women and children.” (Matthew 14:16-21) Jesus beheld the five loaves of bread and two fish through the eyes of God. He knew they simply represented the abundance available to all of us, instead of the insufficient amounts in which the world would have us believe. Living consciously in the presence of God allows us to view life as Jesus did. Jesus could walk on water as well as on land. This ability can be ours too. One of the disciples, Peter, walked on water for a few steps, until he became frightened and lost faith. Jesus caught Peter by the hand and led him back to the boat, while rebuking him, “You of little faith, why did you doubt?” (Matthew 14:28-31) On numerous occasions, Jesus rebuked his disciples for their lack of faith. “Why are you talking about having no bread? Do you still not perceive or understand? Are your hearts hardened? Do you have eyes, and fail to see? Do you have ears, and fail to hear? And do you not remember ….? Do you not yet understand?” (Mark 8:17-21) He expected his disciples to follow his example; he desires the same of us. He gave us a clue as to why we fail to do so: we lack attunement to and faith in our indwelling God. When we meditate within the loving presence of God, we know all things are possible. It is when we focus our attention outside of ourselves and upon the world’s explanations of life that we fail to walk on water, or to perform the seemingly impossible. Jesus was attuned to the angelic beings. He knew God’s mission for the angels in relationship to Earth humans, as explained by the Psalmist: “For he will command his angels concerning you to guard you in all your ways. On their hands they will bear you up, so that you will not dash your foot against a stone.” (Psalm 91:11-12) He also knew how to communicate with those angelic gods in charge of all facets of nature. On at least one occasion, Jesus and the disciples set sail for the opposite shore of the Sea of Galilee. A violent storm arose. Afraid of capsizing, the disciples called to Jesus, who was asleep. Aware of the angelic beings in charge of the wind and water, Jesus simply spoke to them, “Peace! Be still!” Then the wind ceased, and there was a dead calm. He said to them, “Why are you afraid? Have you still no faith?” (Mark 4:39-41) Once more Jesus grows impatient with the disciples because they were unable to maintain a level of faith that would enable them to communicate with the nature gods. Why would Jesus be impatient with his disciples’ lack of faith? Jesus was conscious of his mission—to show us the way back home to knowledge of ourselves as Sons & Daughters of God. He taught: “the one who believes in me [speaking for the Father] will also do the works that I do and, in fact, will do greater works than these, because I am going to the Father.” (John 14:12) (Remember: Jesus speaks the words of “the Father” while serving as a physical plane example to us.) So far, his disciples were having a hard time developing faith in themselves as Sons & Daughters of the Father and therefore, in their capacity to demonstrate all the works Jesus performed. We are no different. We lack faith in ourselves, in our true identity as a Son or Daughter of God, and in our capacity to achieve all the works Jesus executed. How could Jesus perform these works? He spent hours in meditation and communion with his indwelling God. He knew God was within him and that he was within God. There is no separation. Thus, the works that one part of the family of God can do, all can perform. He yearned for us to understand this teaching. According to Edgar Cayce, Charles Fillmore, and the Ascended Masters’ teachings, the soul of Jesus spent eons of time attempting to awaken Earth humans to their former level of attunement to God. When we grow impatient with divine timing and order, think of the eons of time Jesus and other Ascended Masters have sought to rouse our consciousness to the realization of who we truly are. Divine timing and order is not slow; we are! Jesus walked in the presence of God. He knew that even when danger appeared on his path, he was safe from harm. Only when he chose to allow himself to be arrested, beaten, and crucified could harm come to him. He was in full control of his life. In the gospel of Luke, we find Jesus in his hometown of Nazareth, reading the book of Isaiah to those gathered in the synagogue. When he interpreted the reading, the people were enraged. “When they heard this, all in the synagogue were filled with rage. They got up, drove him out of the town, and led him to the brow of the hill on which their town was built, so that they might hurl him off the cliff. But he passed through the midst of them and went on his way.” (Luke 4:16-30) We have the same protection available to us. It is a matter of focus. Do we give attention to the danger and our fear? Or, do we call to the God within and hold our concentration on our own god-power to escape all harm? Like attracts like. Jesus had faith that God’s omnipresence within and around him served as a protective shield. No harm could come to him. Had he reacted with fear or anger, he would have attracted his enemies to him and likely been hurled over the cliff. Instead, even though the people surrounded him, he simply walked away; for he walked in the presence of God. Jesus constantly listened to his intuitive guidance. In so doing, he could stay one step ahead of those who tried repeatedly to trick him into expounding what the religious leaders could consider false teachings. On one such occasion, Jesus healed a paralytic with the words, “Friend, your sins are forgiven you.” A group of religious leaders sat nearby, watching. In silence, they pondered the healing. But Jesus knew their thoughts. “When Jesus perceived their questionings, he answered them, ‘Why do you raise such questions in your hearts?” (Luke 5:17-26) Then, instead of attempting to trick Jesus, they sat in awe of him. We possess the same intuitive powers. We can use our intuitive insights to help us in comprehending the true motives of those with whom we must deal. We can avoid being caught up in the confusion around us. We can discern what is right and good for self and loved ones. We are not defenseless in a world that has been filled with terror. By following our intuitive insights, we can walk in the midst of enemies and not be harmed. We can literally become invisible to the enemy as did Jesus when he avoided being thrown over the cliff. What did Jesus show us about walking in the presence? He revealed how to walk through life with ease, knowing that God’s presence enfolds and provides for us far beyond our needs. There is no danger; there is no lack; there is no vulnerability for those who love the Lord—i.e. universal Law—with all their heart, mind, soul, and strength. We have inherited the right and privilege of living a charmed life! Go forth, knowing that you walk within the omnipresence of a loving Mother/Father God. Meditate upon your Divine Self—your true identity. 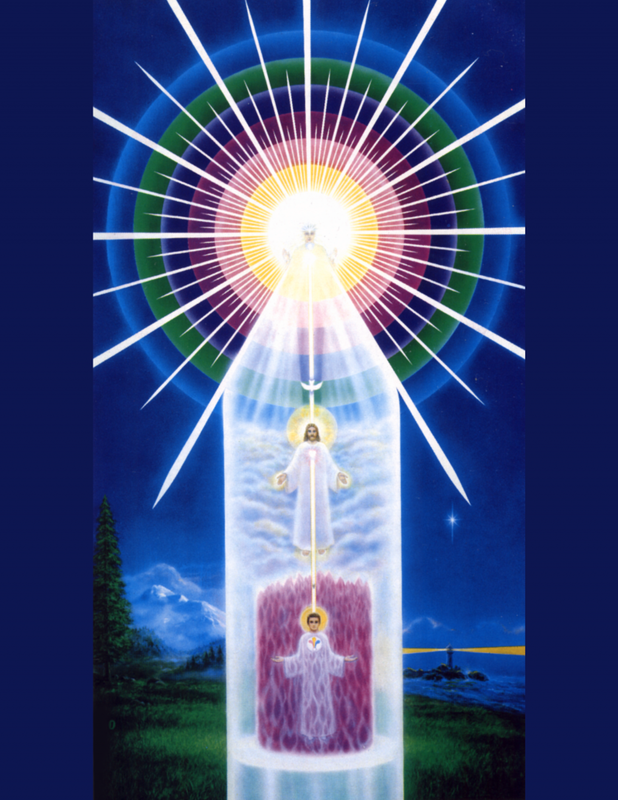 As you go about your daily life, know that an impenetrable shield of White Christ Light enfolds you. You are a multi-dimensional being! The top figure = your I AM PRESENCE – God indwelling you. [i] Painting from Geoffrey Hodson’s Kingdom of the Gods.